VIPRE Antivirus software is a great Antivirus solution with all the right features. Vipre is easy to use and is specifically designed to not slow down your PC. It’s not a typo, VIPRE stands for Virus Intrusion Protection Remediation Engine. We are giving 1 free Viper Antivirus ( 1 year ) Licence, to know the details jump to the end of the post. And it certainly is a low-impact package. After our Vista PC had booted, we saw less than 15 seconds of CPU activity as Vipre initialised - a very light touch for a security package. Even more impressively, RAM usage for the total system peaked at just 762MB during start-up and fell to 516MB within a minute..
As its name suggests, Vipre offers protection from just the malware end of the internet security problem, covering both anti-virus and anti-spyware. This certainly eases the problem of it clashing with other security software, but you’ll still need to bring in your own firewall software. One thing we found faintly disturbing was that, by default, Vipre asked permission before downloading updates. These came reasonably frequently, once a day or so, but it was easy to get distracted and do something other than download the latest update, even if the warning alert was present in the Taskbar. Also, although Vipre has been submitted for external testing, third-party results weren’t available at the time of going to press so, with no track record of protection, it’s difficult to recommend. While the software is not tricky to use, its interface is not particularly sophisticated. Those with a good working knowledge of security software will be able to find their way around but beginners might be better off with a full suite. Sunbelt Software provides a wealth of support options. Within the contextual Help files--when you are on the Tools page, Help opens to the sections on tools. There is also a list of online help URLs, e-mail help addresses, and a toll-free telephone support available on every Help page, so that if you still can't find the answer, you are welcome to try other areas of support. You can even send feedback on the Help file itself. Unfortunately, telephone support is only available Monday through Friday, 9 a.m. to 6 p.m. EST, so if you have a critical problem on the weekend, you'll have to send an e-mail. For a single user, £29.95 is reasonable value for what you get, but if you have more than one PC you can pay £49.95 for an unlimited site licence. If you’ve got more than the three or five PCs on your network usually offered in security software licences, this could work out as an attractive option. The downside, as usual, is that savvy downloaders will find decent alternatives available free of charge. Lets take a look at Antivirus software in terms of how much of a PC Computer's resources are required to perform antivirus scans. 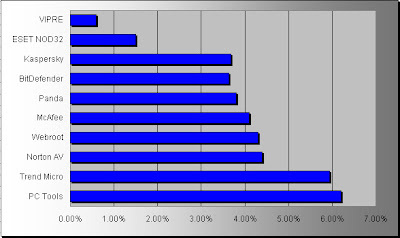 The results of this test show that the resources from the antivirus software were impacted, as the ensuing scanning speeds searching for Virus Infections and other comparable variables ranged in a 0.6% to 6.4% drain of the computers resources, specifically effecting the computers memory. This test was conducted using the top 10 brands of Antivirus software that averaged the most consumer sales to date. By looking at this Antivirus software comparing virus scans to memory usage, the lower the percentage of usage, the faster ones computer will perform. In reviewing the antivirus programs volume of memory during a manual virus scan, the results show a lighter aggregate of memory in use with the VIPRE Antivirus software, while the Trend Micro AntiVirus takes up more than 4 times the amount of attributed memory resources. The Good: Vipre combines antivirus and antispyware in one engine; offers secure deletion of files and browsing history; exposes hidden processes running on your computer; fully functional, 15-day, free trial. The Bad: Vipre does not yet include firewall protection. The Bottom Line: Vipre combines antivirus and antispyware technology in a fast and light application that also includes a worthy set of security tools. 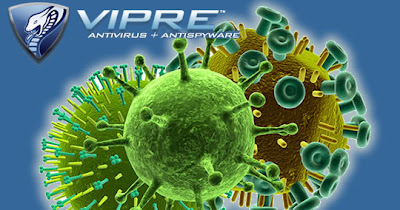 Vipre Anti-virus + Anti-Spyware is the best utility of its kind that I have used in a long time. It is surprisingly light on system resources even while scanning, you won’t even know it’s running. The liberal Home Site Licensing is very welcome for the user on a tight budget. The cost of a one year unlimited license is $49.95 which covers all of the PC’s you have in the residence. A cheaper license of $29.95 can be purchased for one machine. 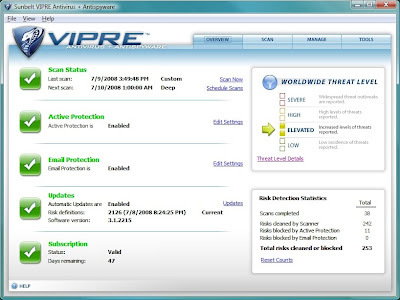 If you are looking for a powerful security program that does not slow down your PC then Vipre is highly recommended. We are giving away 1 free Viper Antivirus (1 Year) License to one lucky reader of this blog. All you need to do is subscribe to our feeds via email. We will pick one lucky winner via a lottery. Is you have not subscribed to our feeds yet, this is the best time.Winner would be announced on 29th May.